It is time for the 6th annual 7th District New Fire Fighters Conference to be held in Kennewick, Washington and the date is fast approaching. The event is scheduled for May 14-16. The event promises to share knowledge of the IAFF, 7th District, State Associations, Politics, Health & Safety and the big picture of Labor and its role in leveling the playing field for those that trade their sweat and education for a wage. Premium speakers will get new members motivated to give back to the Union that has provided so much to them and US. Local 2024 fully support the Brothers and Sisters of Teamsters 763 in their Labor dispute with the employer AMR. South King Fire and Rescue has a contract for service with AMR. 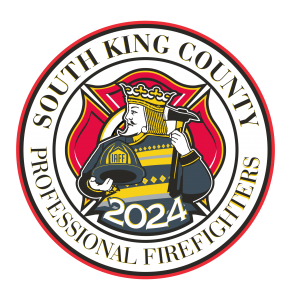 Local 2024 and South King County Fire and Rescue agree that enforcing the contract for service with the agreed upon performance penalties is one of the ways we can support the Teamsters in their effort to force AMR back to the negotiation table to bargain a fair contract. Teamsters 763 fully understands that as sworn fire fighters we are obligated to provide BLS services, including transport when necessary, and do not expect us to withhold any EMS services during the strike. Local 2024 is working under the close direction of the WSCFF and IAFF 7th District Vice President Ricky Walsh. Teamsters Local 763 is still preparing for a strike on Friday at noon; and so is AMR. You may notice “riders” on AMR apparatus at incident scenes. These are potential replacement workers who are “observing” in order to learn the job in preparation for the strike. They are “scabs.” Many of these people are supervisors, and/or, from out of state. At this point in time those people from out of state will not be able to operate as an EMT in Washington State. Local 27 has been working with our elected officials to deny recognition of out of state employees. •Be professional and respectful with all AMR employees, especially in public. •Do not threaten any AMR employees. •Please express support for AMR EMT’s and Teamsters 763 as they fight for a fair contract. Are you going to be working if there is a strike? What were you going to do over the Christmas holidays before having to replace the Teamsters? Date of funeral is Tuesday July 3rd. Jet Blue is allowing free for Firefighters attending the funeral. South King County Professional Firefighters IAFF Local 2024 updated their cover photo. Baker's motto was 'Carry on, Warrior' as he battled lung cancer he linked to his firefighting career. True. NPR piece on a primary agent in foam is a strong carcinogenic agent and is never excreted by the body. South King County Professional Firefighters IAFF Local 2024 is at The Westin Bonaventure Hotel & Suites, Los Angeles. South King County Professional Firefighters IAFF Local 2024 shared a post. Will you be having a fundraising auction next year?